Cam, Stacy and Ty: Let the Adoption Journey Begin!!!! Let the Adoption Journey Begin!!!! Today is an exciting day!!! Our adoption profile is online! We are so excited to begin the journey of adopting again and adding a new little one to our family. 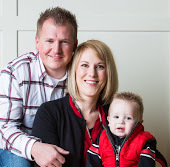 You can check out our profile by clicking on our picture on the left side of our blog or by visiting www.itsaboutlove.org and searching Cameron and Stacy from Utah. You can also check out our adoption blog at camandstacyadoption.blogspot.com!! !